Memorial day is just a few days away and you know what that means, Summer is about to (un)officially begin!! *excited dance* I’m already getting requests for recipes to bring to BBQs and potlucks on social media, so I thought I’d do a round up. Here are 25 of my favorite recipes for summer BBQs and Potlucks. I suspect that most people will do classic burgers, dogs, chicken, and ribs for their main grilling dish, but I have included a couple specialty burgers, plus a vegetarian alternative so that everyone can eat happy. In addition to that, I have plenty of salads, sides, and other dishes that you can bring to feed a crowd. Full disclaimer: most of these recipes are for around six servings, so please consider the size of your party and scale up the recipes as needed. You can scale the recipes on my site by simply typing in a new number in the servings field on the recipe card and the ingredient quantities will automatically adjust. Yay! Burgers and Alternatives: Traditional burgers are great, but if you want to try something new or have guests who don’t do red meat, check out my Green Chile Turkey Burgers (pictured above), or my Greek Turkey Burgers. 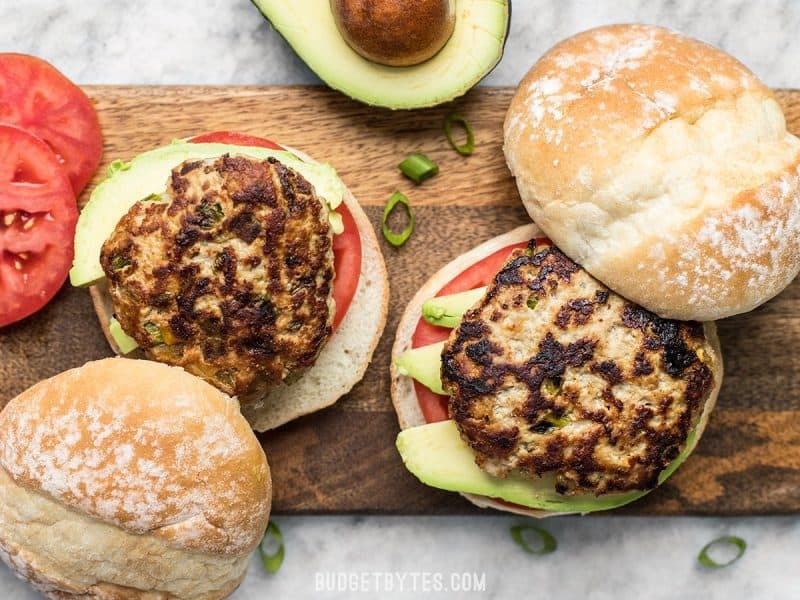 Both have a slew of fun add-ins that give the burgers tons of flavor and a little more visual appeal as well. Got a vegetarian guest? Whip up a batch of these BBQ Bean Sliders so they can have a sandwich to sink their teeth into as well (for a potluck, the beans can be kept warm in a slow cooker). A couple of other great meat dishes that can be cooked on a grill instead of the oven or stove top are my Sticky Ginger Soy Glazed Chicken and Greek Marinated Chicken. Potato Salads: What is a potluck or BBQ without a potato salad?? While I love my traditional Southern Style Potato Salad (pictured above), sometimes I like to mix it up with different flavors. A Cajun Potato Salad is an simple twist that adds a TON of spice and flavors to the mix, without needing a lot of extra ingredients. If you want a potato side without out all the mayonnaise and other heavy dressings, give these Skillet Potatoes and Green Beans a try. They pair wonderfully with grilled meat! Sweet potatoes are also an option. While not a “potato salad” these Chili Roasted Sweet Potatoes would make an awesome side to grilled food. 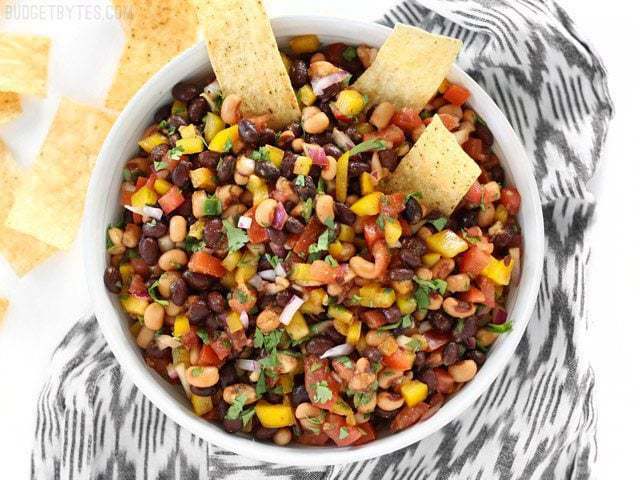 Bean Salads: Bean salads are a classic potluck staple, and my all-time favorite is Cowboy Caviar (pictured above) because it’s not only delicious, but it’s pretty. Why do I care if it’s pretty? Well, on a table brimming with dishes from several families, you need something that stands out and says, “EAT ME.” Oh, and did I mention that it’s actually healthy? Sometimes you need a bit of balance when it comes to BBQs and Potlucks. Some other great bean salads that are great for cook-outs are Roasted Sweet Potato Rainbow Salad with Lime Crema (actually beans, sweet potatoes, and vegetables), Marinated White Beans, and Cumin Lime Chickpeas. 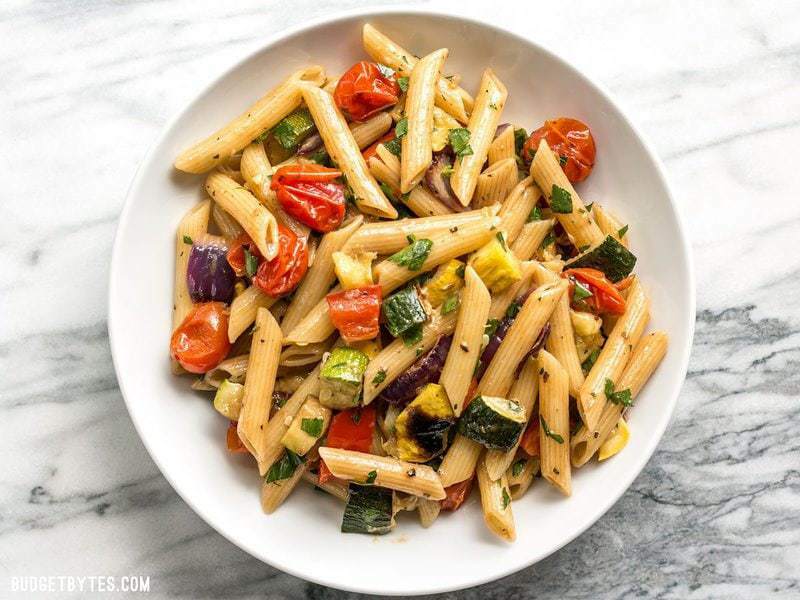 Vegetable Salads and Slaws: When it’s hot and you’re eating outside, vegetables salads become EXTRA refreshing. 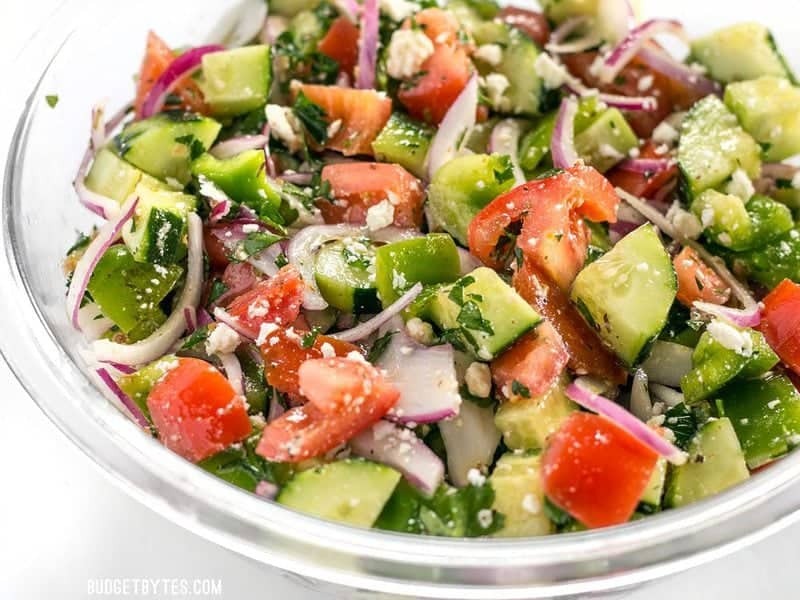 My favorite is definitely my Super Fresh Cucumber Salad (pictured above) because it just tastes and smells like summer in a bowl (plus it’s easy to prepare). But I also love Vinaigrette Slaw with Feta, and Cumin Lime Coleslaw (a fun, lighter, refreshing twist on traditional coleslaw). Other Items: And of course there are a few miscellaneous items that would be fun for an outdoor BBQ or Potluck, like Pickled Red Onions (to top your burgers or salads), maybe some Strawberry Rosé Slushes, an Orange Pineapple Julius, or some cold Chili Lime Cantaloupe to snack on while everyone is waiting for the food. 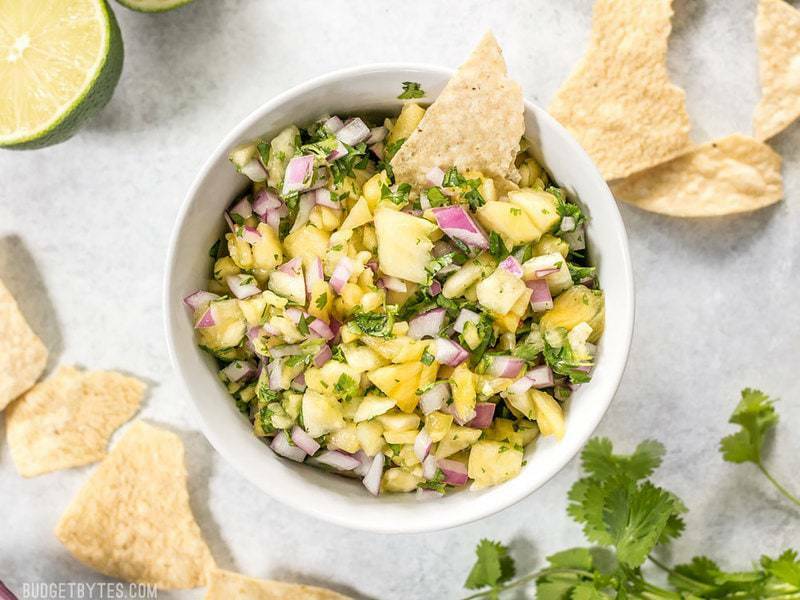 Oh, and you totally need to make some Easy Pineapple Salsa (pictured above) for topping burgers or serving as an appetizer with chips!! I don’t know if I’ve told you, but I’m OBSESSED with summer and even just writing this post has gotten me so excited! I can’t wait for spending time outside, playing in the water, and grilling delicious food. What are you favorite summertime foods for BBQs and Potlucks? Share in the comments below! The post 25 Recipe Ideas for Summer BBQs and Potlucks appeared first on Budget Bytes.